Because the time available to you for explore the Island is precious and limited, don’t let it be consumed by chores. To make the most of your time, it is recommended you minimize campsite food preparation to the greatest degree possible by doing everything you can in your kitchen ahead of time (washing, chopping, sautéing, cooking), and bringing your entrées to the Island in as near a state of completion as possible; saving you the headache of lots of messy pans and utensils, garbage, and lost time. DINNER – Some meals lend themselves well to pre-prep and camping conditions: soups, stews, chili, pasta and sauce. Choose dishes that don’t scorch easily. Barbecuing and open fires are not allowed and all trash must be packed out with you. There are no trashcans on the Island. LUNCH – Prepare sandwiches and wrap for consumption on the first day. The second day’s lunch should be prepped in camp on the morning of the second day and will be taken with us in the kayaks. BREAKFAST – Plan for a speedy exit in the morning; the sooner we get going, the better the kayaking conditions and the more caves and sea life we’ll see. If you can, avoid the time-intensive breakfasts. Opt instead for oatmeal, cereals, bagels, muffins, and fruit. Going camping on the island? 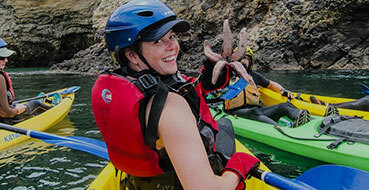 Then join us for a one day kayaking trip and explore all that the Santa Cruz Island sea caves have to offer! Want to kayak for more than one day? Then join us for either our 2-day kayak and camp or 3-day kayak and camp trip. Visiting the islands is a once in a life time experience, don’t let it pass you by! Have experience camping on the island? Share it in the comments section below!